The miter gauge is an essential tool for all table saw owners. If you want to create precision square or angle cuts with your machine, a quality gauge will remove the margin for error, giving you excellent results each and every time. However, being so essential means there are a number of products on the market. Knowing which is the best miter gauge to buy is no easy task. That’s where we aim to help. For this review round up we have taken 5 top rated miter gauges and put them through their paces. For our findings at a glance just head to the table below. For in depth reviews of each tool, plus a short buyer’s guide, keep on reading. 30, 45, 60, and 90º. 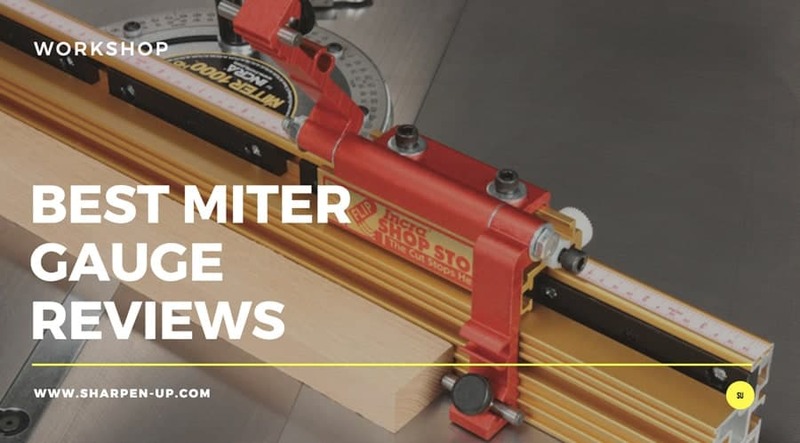 Before we dive into the review section, we shall take a look at some miter gauge basics, including how a table saw miter gauge works. 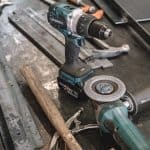 If you already own one of these handy tools, you might want to head here for more details on how to get the most out of it. What is a miter gauge? A miter gauge is guide unit that features an in-built calibrated protractor which allows a woodworker to cut work material at an angle. The key component is the section of the tool that resembles a half-moon. This pivots around so that the user can choose any angle between 45 and -45 degrees to make the cut. The gauge fits to the miter slot of the table saw worktable. There are usually two miter slots, one to the right and the other to the left of the saw blade. However, the miter gauge is fitted to the left miter slot. These days it is also possible to buy miter gauges that include the ability to clamp the workpiece in place. Some models also have have adjustable stops for accurate, repetitive machining of work materials. The miter gauge assembly is made up of two distinct parts; the long thin guide bar (the miter bar) and the miter gauge unit. 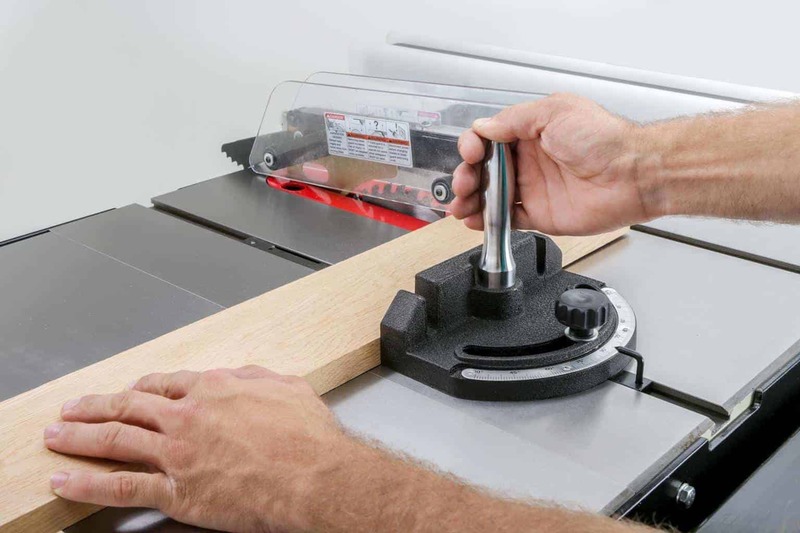 The guide bar is fitted securely into the miter slot, and it allows the miter gauge unit (also called the miter gauge head) to ride along it in parallel direction in relation to the saw-blade. 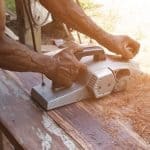 This enables the woodworker to place a wood-piece in front of the miter gauge unit, and then use the miter gauge to ride this wood-piece through the saw-blade. As we mentioned above, the miter gauge head features a flat half-moon shaped metal plate (the protractor top-plate) that is pivoted to the miter bar. This pivoting allows the user to change the angle of the protractor top-plate relative to the miter bar. The straight edge of the protractor top-plate is either extended vertically to create a vertical plate, or a vertical plate is mounted on it. The wood piece rests on this vertical plate. Once the miter head is positioned at the correct angle, it is clamped to the miter bar so that this angle is maintained during sawing. Sometimes, the wood-piece can be clamped to the vertical plate of the miter head so as to prevent it from sliding as it is being guided to the saw-blade. Now it’s time to take an in depth look at each of the miter gauges that made our top 5 list. 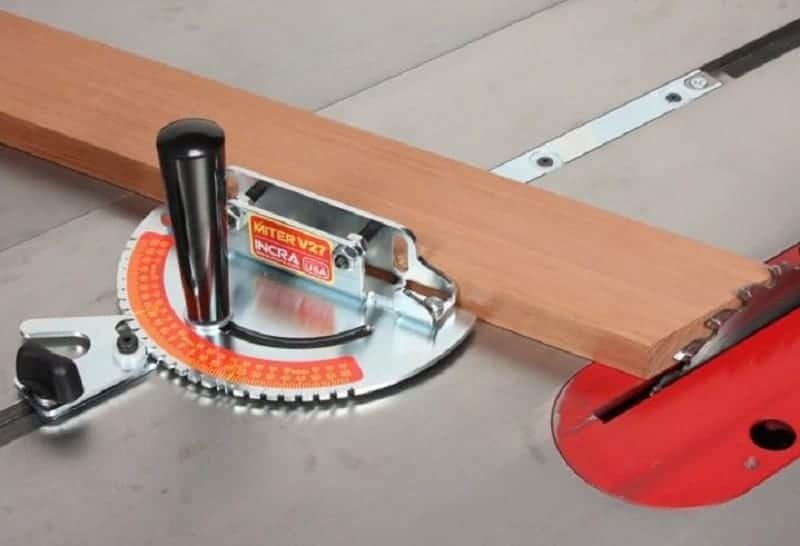 This miter gauge from the ever-reliable Incra is designed as a mitering solution assembly for almost any standard table saw. It is the only high-definition (HD) miter gauge model in the Miter 1000 series of miter gauges designed, manufactured, and calibrated by Incra Precision Tools, a Dallas-based subsidiary of Taylor Design Group, Inc.
Incra Precision Tools are a well known manufacturer of quality woodworking machines and devices including miter gauge upgrades. The 1000HD miter gauge assembly weighs about 8 pounds, which makes it a lightweight device that can be easily lifted and placed on a worktable, before the miter bar is securely fitted in the miter slot. Dimension are good too, with the miter bar measuring about 21 inches long. This allows it to fit into almost all standard-width table saws. The semicircular-shaped miter gauge head measures 7.8 inches in length, and 3.6 inches wide. 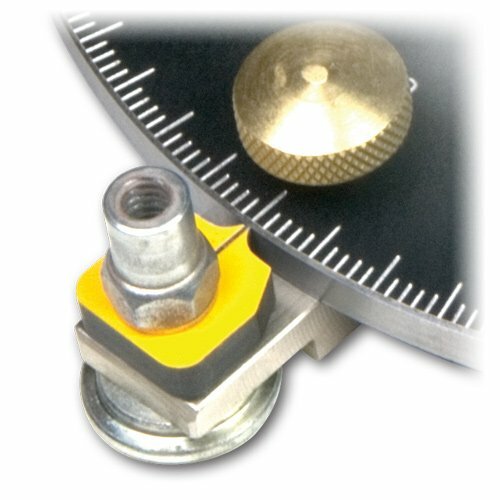 On the protractor plate is a fence mounting bracket that has mounting fasteners. In this mounting bracket is fitted a telescoping IncraLOCK fence. The IncraLOCK fence is an 18-inch fence that supports telescoping, that is, it can be extended from 18 inches to 31 inches by extracting its extendable bar (also called telescope bar) from its housing in the hollow 18-inch frame. This fence also features a front-facing T-slot allowance that allows a woodworker to fit a zero-clearance sub-fence to the IncraLOCK fence. Likewise, the IncraLOCK fence comes with a positioning rack that slides along it, with its Flip Shop Stop feature allowing this rack to be securely at a set position along the fence. This allows for the wood-piece to be cut to a specified length. 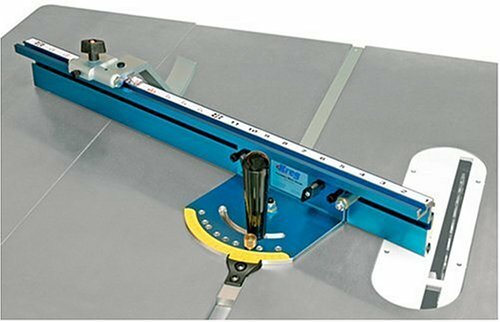 This miter gauge is described as HD because its protractor top-plate features the AngleLOCK indexing system. This indexing system allows for 180 angle stops with the user being able to make 1-degree increments to their preferred angle stop. Furthermore, this indexing system features 7 special stops which are located 22.5 degrees away from each other, and the 0-degree and 180-degree marks. This gives the protractor plate a high-resolution. 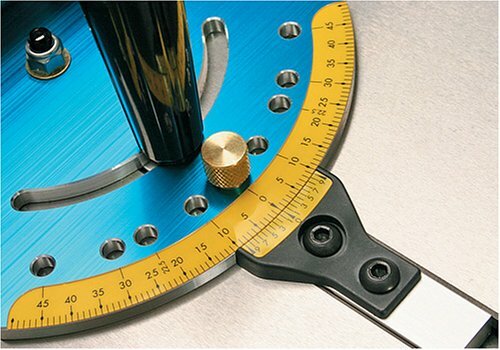 What is more, this protractor plate rides on a smooth adjustable miter bar. The miter bar features a GlideLOCK assembly which is made up of 6 expansion disks fitted along both sides of the bar. These disks are tightly wound, and when they are loosed in a controlled fashion, they expand. This miter bar can fit into any standard miter slot, but not tightly as its width is about 0.740-0.765 inches smaller than the width of standard miter slots. To secure this bar tightly to the miter slot, the expansion disks are carefully loosed, and as they expand, they hold the bar tightly against the miter slot. This eliminates any play that the bar could have in its miter slot. The most unique feature of this miter gauge is its protractor top-plate. The semi-circular edge of the protractor plate features V-shaped grooves which serve as the precision-angle indexing teeth. This indexing teeth work together with an actuator lever assembly. 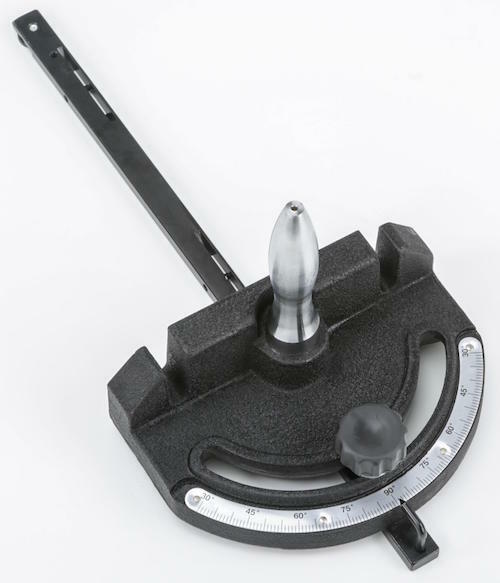 The actuator lever assembly is attached to the front-end of the miter-bar and it features a 0.1 degrees vernier cursor which single tooth of the actuator lever to fit into the right V-shaped groove on the protractor plate hence securing the protractor plate on a specific angled position. Both the protractor plate and the vernier cursor plate are made from laser-cut solid steel plates that are then precisely calibrated. The process of segmented turning is simplified by using the IncraLOCK cut-off fence assembly alongside a clamped protractor plate. Segmented turning allows a woodworker to shape a wood-piece, for instance, the protractor plate can be set at 25.7 degrees and clamped down on the miter bar, while the fence assembly allows a 7-sided wooden plate to be cut out of the work-piece. Likewise, this protractor plate-and-fence assembly allows for multiple pieces of precisely shaped to be sawed quickly. The INCRA Miter1000/HD miter gauge benefits from a 12-months warranty that is guaranteed by the Taylor Design Group,Inc, so long as it is purchased from an authorized trader and duly registered online with Incra Precision Tools. Pros of the INCRA Miter1000/HD- Easy to use. Fits well in standard miter slots. Sub-fence and jig compatibility through its IncraLOCK fence. Allows for repeatable cuts to be made quickly. Features a telescoping IncraLOCK fence system for handling long workpieces. Bulky design due to its incorporation of a fence system. Fence flexes when it is extended to 31 inches. The INCRA Miter1000/HD is a HD miter gauge assembly designed as a mitering solution assembly for standard table saw. It is an easy to set-up and use miter gauge that fits well in standard miter slots, while it sub-fence/jig-compatible IncraLOCK fence allows for handling of long workpieces, with the quality of work being superbly improved by angling done using its high resolution protractor. The superb construction, outstanding cost-performance ratio, and exceptional quality of the work done by the INCRA Miter1000/HD makes it (in our opinion) the best miter gauge in our top 5 round up. This after-market table saw miter-gauge from Osborne Manufacturing features a telescoping fence, and supports triangular stability. It is designed as a mitering solution assembly for standard table saws. This miter gauge assembly weighs about 7.8 pounds, which makes it a lightweight device that can be easily lifted and placed on a worktable, before being securely fitted in the miter slot. The miter bar is about 25.9 inches long, which allows it to fit well into almost all standard-width table saws. 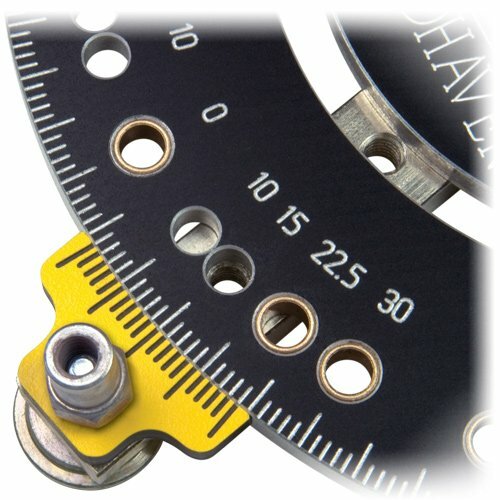 The most unique feature of Osborne EB-3 miter gauge is its lack of a protractor plate. Instead, this gauge uses a triangular model for angling the workpiece, as well as maintaining stability during use. The three bars that make up this triangular model are the miter bar, a calibrated fence bar, and an extensible connection bar that connects the fence to the miter bar. The connection bar is pivoted to the front end of the miter bar, and its far end slides along a groove in the fence bar. The miter bar also features a handle. Just in front of this handle is where the fence bar pivots along the miter bar. The miter bar therefore features two pivot points; one for the extensible connection bar, and the other for the fence bar. These pivot points are non-movable; and to angle the workpiece, the woodworker needs to place it on the front-edge of the fence bar. Afterwards, the connection bar is slid along its groove in the fence bar, and if it is slid further from the miter bar, its (connection bar) length increases and this causes the fence to pivot towards the miter bar, hence angling the workpiece at an acute angle. Furthermore, if the connection bar is slid along its fence groove towards the miter bar, its (connection bar) length decreases and this causes the fence to torque away from the miter bar, hence angling the workpiece towards a 90-degree (right) angle. The connection bar is calibrated from -45 degrees to 45 degrees, which gives it a total range of 90 degrees. On the other hand, the fence bar is calibrated in both centimeters and inches. In the miter bar section between the pivot for the connection bar and the handle, there is a set of 10 calibration markings that correspond to set degree-angle values. Its fence bar supports telescoping and it can be extended to 42 inches by extracting its telescope bar from its housing in the hollow grooved frame. Just like the fence bar of the 1000/HD and Osborne EB-3, this tool features a Flip Shop Stop that allows a workpiece to be secured at set positions along the fence, hence enabling the woodworker to cut the wood-piece to a specified length. The Osborne EB-3 also features an indexing system that allows for 20 stops along the 90-degrees markings on the connection bar. It allows the user to make 5-degree increments to their preferred angle stop. The miter bar of Osborne EB-3 features 3 expansion disks fitted along both sides of the bar. To secure this bar tightly to the miter slot, the expansion disks are carefully loosened. As they expand, they hold the bar tightly against the miter slot. This eliminates any play that the bar could have in its miter slot. The Osborne EB-3 miter-gauge unit comes with a Lifetime Warranty guaranteed by Osborne Manufacturing, as long as it is purchased from an authorized trader and duly registered with the company. Bulky design due to use of 3 bars. Not as accurate as INCRA Miter1000/HD miter-gauge. Fence flexes when it is extended beyond 40 inches. The Osborne EB-3 is an after-market table saw miter-gauge unit that features a telescoping fence, and supports triangular stability. It is designed as a mitering solution assembly for standard table saws. 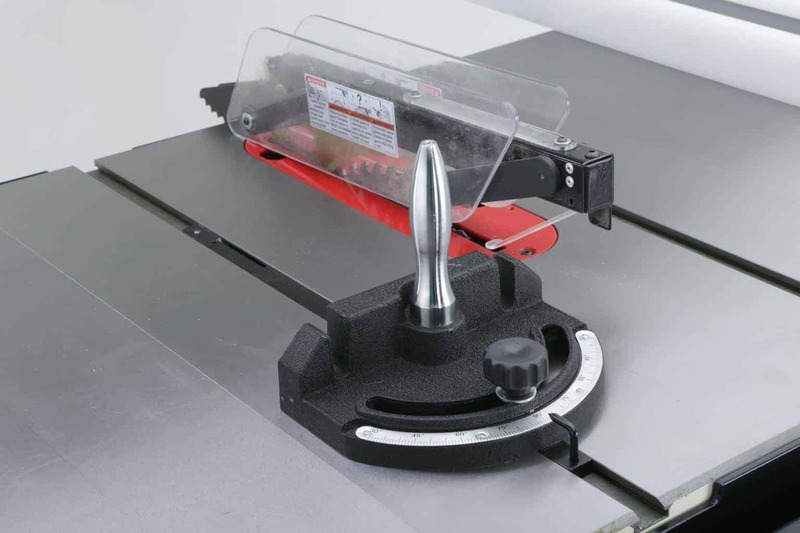 It is an easy to set-up and use miter gauge that fits well in standard miter slots, and it can handle long workpieces, with the quality of work being improved by proper angling of the fence bar relative to the miter bar. This after-market table saw miter-gauge unit features a well-machined gauge head that is factory calibrated for accuracy. It is therefore designed as a precision miter-gauge system that does not require constant calibrations. It is designed, manufactured, and calibrated by Kreg Tool Company. The Kreg KMS7102 miter-gauge assembly weighs about 6.1 pounds, which makes it lighter than either INCRA or Osborne miter gauges reviewed above. This also means that it can be easily lifted and placed on a worktable, before the miter bar is securely fitted in the miter slot. The miter bar is about 25.2 inches long, which allows it to fit well into almost all standard-width table saws. The semicircular-shaped miter gauge head measures 6.2 inches in length, and 2.6 inches wide. On the protractor plate is a fence mounting bracket that has mounting fasteners. In this mounting bracket is fitted a fixed-length (non-telescoping) fence bar. The miter gauge assembly features a glossy blue finish. The aluminum fence bar is 24-inches long and it features a patented Swing-Stop that slides atop the fence bar. The swing-stop is the equivalent of the Flip Shop Stop that is found in both the INCRA Miter1000/HD and the Osborne EB-3. The bar is also calibrated, and it is equipped with a self-adhesive measuring tape. The calibrations on the top surface of the bar are CNC-milled for accuracy and for better reading of these calibration markings. The Swing-stop comes with a lens whose high-visibility red line immediately points the user to the correct measurement value on the calibration scale. This swing-stop therefore also functions as an accurate positioning rack that securely sets the wood-piece at a set position along the fence. This allows for the wood-piece to be cut to a particular pre-determined length. The Kreg KMS7102 also has a protractor top-plate, which features an indexing system. This indexing system allows for 180 angle stops. Likewise, this indexing system features 5 special stops at the 0, 10, 22.5, 30 and 45-degree marks. Unlike the 1000HD and EB-3 miter gauges which have expansion disks, the Kreg features 5 bar adjusters that secures the anodized aluminum miter bar to its miter slot. This miter bar is built to standard dimensions with its cross-section measuring 3/4-inch in width, and 3/8-inch in height. The bar adjusters hold this miter bar tightly against the miter slot, thus eliminates any play that the bar could have inside the slot. The most unique feature of this miter gauge is the double-scale at its protractor top-plate. The semi-circular edge of the protractor plate features the angle calibrations in degrees. This edge is abutted by another plate that features a vernier scale whose calibrations start from 0 and end at 10. This vernier scale allows for the angle value to be precisely adjusted to 0.1 degrees error range. The vernier plate is fitted to the top of the miter bar. The Kreg KMS7102 miter-gauge unit comes with a Lifetime Warranty guaranteed by Kreg Tool Company, as long as it is purchased from an authorized trader and duly registered with the company. Pros of the Kreg KMS7102- Easy to use. It cannot properly handle workpiece longer than 30 inches. The Kreg KMS7102 is an after-market precision miter-gauge system that features a well-machined gauge head that is factory calibrated for accuracy. It is designed as a mitering solution assembly for standard table saws. 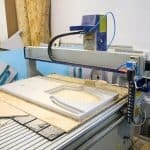 It is an easy to set-up and use miter gauge that fits well in standard miter slots, and it can handle most workpieces, with the quality of work being improved by proper angling of its high resolution protractor. This heavy-duty miter gauge features only two components, a well-machined miter gauge head and a miter bar. On the face of its protractor is an an 120-degree scale, which allows the woodworker to angle the workpiece to a maximum of 60 degrees, in either right-wise direction or left-wise direction. It is designed, manufactured, and calibrated by Woodstock International, Inc. The Woodstock D3123 miter-gauge assembly weighs about 9.9 pounds, which makes it heavier than all three of the miter gauges reviewed so far. It is this heavy because of its use of cast metal materials. Even so, it can still be easily lifted and placed on a worktable, before the miter bar is securely fitted in the miter slot. The miter bar is about 18.5 inches long, which allows it to fit well into almost all standard-width table saws. The semicircular-shaped miter gauge head measures 8 inches in length, and 2.4 inches wide. Its miter gauge head is made from cast iron, and has a black finish. On this miter gauge head is fitted a 5 inches tall chrome-plated handle. Just like the miter gauges reviewed above, the Woodstock D3123 features a standard miter bar. This means that its miter bar is built to standard dimensions with its cross-section measuring 3/4-inch in width, and 3/8-inch in height. This allows the miter bar to fit into standard miter slots in rip table saws, as well as fit into T-slots of cross-cut table saws and band table saws. 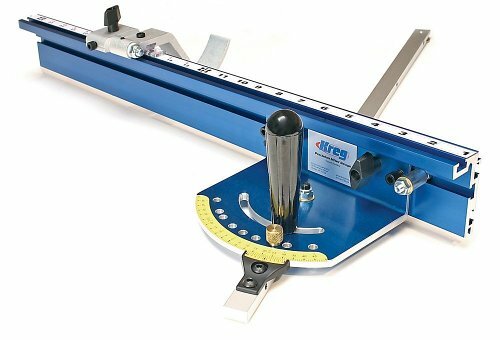 This miter gauge does not feature a fence bar, nor does its protractor plate provide any allowance for brackets that can be used to mount a fence bar. This indicates that it was built to be used without a fence bar, and this means that it was designed to work optimally with standard-sized wood-pieces that can be handled by any standard table saw that is fitted with a table-saw fence. Even so, this means that the Woodstock D3123 miter-gauge assembly cannot handle segmented turning, nor can it be used for sawing compound cuts on any wood that is over 30 inches long. 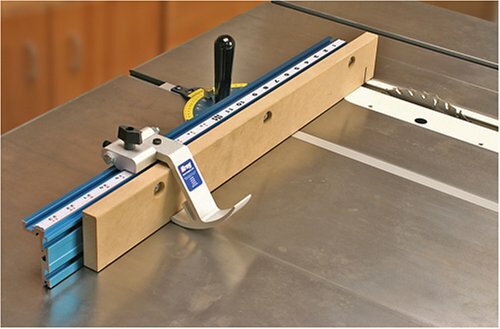 The lack of a fence also means that Woodstock D3123 miter-gauge cannot be used to cut any wood-piece to a particular pre-determined length, unless the table saw on which it is mounted there is an adjustable table-saw fence. 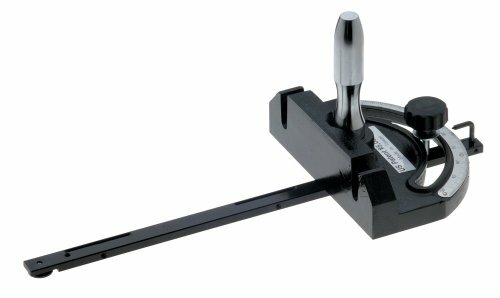 Another unique feature of the Woodstock D3123 miter-gauge is that its protractor top-plate lacks an indexing system. This definitely reduces the accuracy and precision of the angling process. Even so, this miter gauge assembly is quite cheap, hence explaining its feature-bland design. Regardless, it can still handle most standard mitering functions well, hence its inclusion in this list. The Woodstock D3123 miter-gauge comes with a 24-months warranty that is guaranteed by Woodstock International, Inc; as long as it is purchased from an authorized trader and duly registered online with the company. 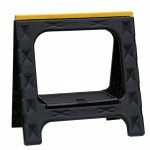 Pros of the Woodstock D3123- Easy to use. Woodstock D3123 is a heavy-duty miter gauge that features an 120-degree protractor. It has a well-machined gauge head that is designed as a mitering solution assembly for standard table saws. It is an easy to set-up and use miter gauge that fits well in standard miter slots, and it can handle most workpieces. This is a high-quality, well-machined miter-gauge unit that is factory calibrated for accuracy. Just like Kreg KMS7102, it is designed as a precision miter-gauge system that does not require constant calibrations. It is designed, manufactured, and calibrated by Woodhaven. The Woodhaven 4911 Deluxe miter-gauge assembly weighs about 3.9 pounds, which makes it lighter than either all the other four miter gauges in this review. This also means that it can be easily lifted and placed on a worktable. The miter bar is about 25.2 inches long, which allows it to fit well into almost all standard-width table saws. The semicircular-shaped miter gauge head measures 6.7 inches in length, and 2.6 inches wide. Its miter gauge head has a black finish, and its protractor face features an 150-degree calibration (90 degrees in the left-wise direction and 60 degrees in the right-wise direction). On this miter gauge head is fitted a 5-inch black handle. Just like the other four miter gauges reviewed above, the Woodhaven 4911 features a standard miter bar. This means that its miter bar is built to standard dimensions with its cross-section measuring 3/4-inch in width, and 3/8-inch in height. This allows the miter bar to fit into standard miter slots in rip table saws, as well as fit into T-slots of cross-cut table saws and band table saws. Just like the Woodstock D3123 miter-gauge, the Woodhaven head does not feature a fence bar, nor does its protractor plate provide any allowance for brackets that can be used to mount a fence bar. 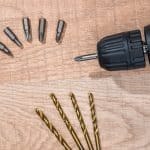 This therefore indicates that it was built to be used without a fence bar, and this means that it was designed to work optimally with standard-sized wood-pieces that can be handled by any standard table saw that is fitted with a good table-saw fence. 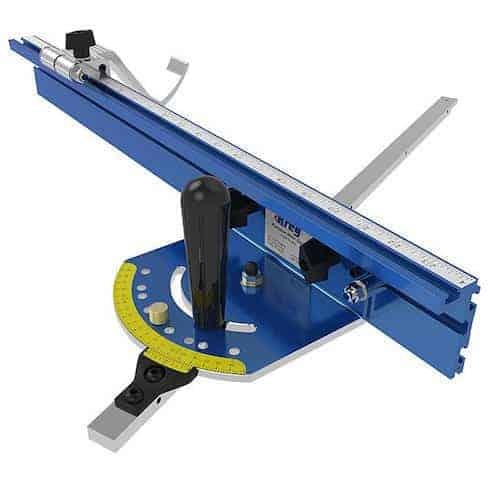 Besides, this also means that the Woodhaven 4911 Deluxe miter-gauge assembly cannot handle segmented turning, nor can it be used for sawing compound cuts on any wood that is over 30 inches long. The lack of a fence also means that Woodhaven 4911 Deluxe cannot be used to cut a wood-piece to any particular pre-determined length, unless the table saw on which it is mounted there is an adjustable table-saw fence. 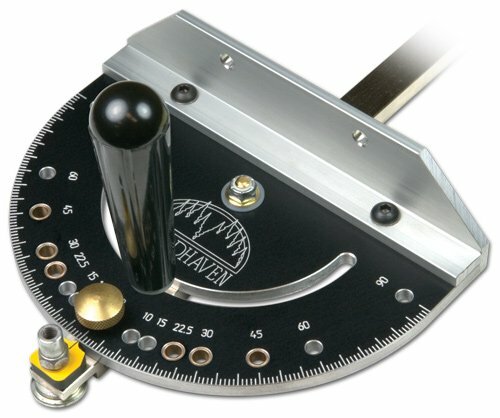 However, unlike the Woodstock D3123 miter-gauge, the Woodhaven 4911 Deluxe miter-gauge assembly features an indexing system on its protractor top-plate. This definitely gives it better precision and accuracy compared to the Woodstock D3123 . Even so, this miter gauge assembly is quite expensive when compared to the D3123. Still, it can handle most standard mitering functions well, hence its inclusion in this list. The 4911 Deluxe miter-gauge unit comes with a Lifetime Warranty guaranteed by Woodhaven, as long as it is purchased from an authorized trader. Woodhaven 4911 Deluxe is a high-quality, high-performance, and well-machined after-market precision miter-gauge system that is factory calibrated for accuracy. It is designed as a mitering solution assembly for standard table saws and it can handle most workpieces. There are better options in our top 5 however.